Sales are no longer driven simply by word of mouth, personal referrals, extraordinary print advertising, attention-grabbing multi-media ads, and search engine optimization. Your company also must have a social media footprint that is vibrant and engaging. Vibrant social media is colorful, active, and unique. It makes your company stand out, showcasing who you are, what you value, and why your product or service is the best out there. It means you have pictures, videos, polls, discussions, and more--a great variety of content. Engagement is your ability to connect with customers, fans, and followers so that they are liking, commenting on, and sharing your content, which of course improves your visibility and increases sales. Facebook and Instagram are two commonly used tools for accomplishing this kind of vibrancy and engagement. Business owners need to understand when to use each one. 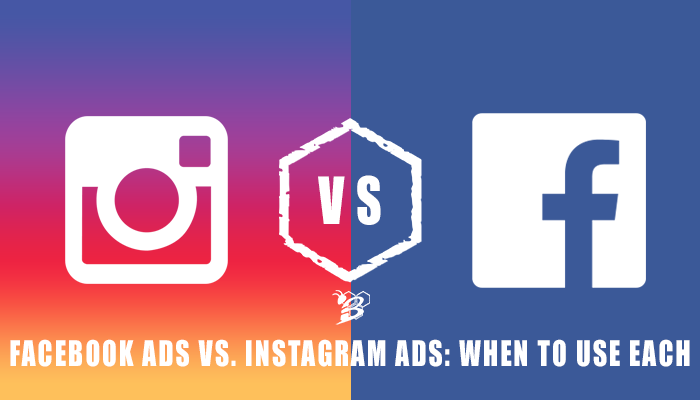 Before you can understand which platform is best for your next ad campaign, it’s important to understand the parameters, benefits, and drawbacks of both social networks. Once you have a grasp on those differences, you can start thinking about where you want to spend your advertising budget. Facebook is the world’s largest social media site. About 2 billion people around the globe use Facebook every month, and for many consumers, Facebook and social media are nearly synonymous. A company that doesn’t exist on Facebook is at a great disadvantage simply because of the potential to reach so many people on the platform. One of the trickiest things with running a business page on Facebook is that you always have to adapt to changes. There are the changes that Facebook makes, like when they started prioritizing paid content over anything built with organic likes and shares. That means that companies that used to be really good at getting likes and shares without paying for advertisements have ended up being stifled by Facebook’s algorithm that shows users more paid content from companies instead of original, organic content. Not all changes are based on policy changes or adjusting to algorithms. Some of them are just cultural shifts that affect Facebook advertisers. One big aspect of this is that younger people are not drawn to the site they way they were in the past, as they’ve shifted to other networks like Instagram and Snapchat. Videos are prioritized by the current algorithms, so video content can be more effective than images. Images are still better than text alone for building engagement and visibility. Facebook can give you a ton of insights for each post that you make, including how many people saw it, shared it, commented on it, responded negatively to it (by unsubscribing to your posts or hiding the post itself), or clicked on additional links. Having an active presence on Facebook is a requirement for small businesses. The question for every business owner, then, is how they want to make use of the network. Instagram is smaller than Facebook, sure, but it’s still a major player in the social media marketplace. It has about 800 million active monthly users. In 2017, there were 25 million business profiles on the site. Clearly, companies are finding that there are benefits to sharing content and promoting products and services using Instagram, which is primarily used as a mobile app. posting during peak hours, when users are most likely to engage with your material. creating eye-catching images that capture the attention of people scrolling Instagram for aesthetic pleasure, not to shop. keeping up with engagement data from posts to see what’s working and what isn’t. fostering engagement by getting people to “heart” and comment on shared content. One of the major benefits of organic content on Instagram is the way that hashtags and tags can increase your company’s visibility and engagement. Hashtags are searchable, so you want to come up with something that is unique to your company that people can click on to see all of your posts--or posts that your fans and followers have used to talk about you. However, you can also use hashtags so that people can discover you on their own. Building a social media presence on these two sites is only one piece of the platform puzzle. Another significant piece is the actual advertising you can do on those sites. It’s important to know which site/app is best for your specific needs before you start investing in digital advertising. Facebook ads are great for one really specific reason: targeting. You can get super specific in terms of demographics that you want to target. Age ranges, gender, physical location, likes, interests, and behaviors are all possible factors in the ads you run. Facebook advertising also has such a huge potential for reach. With so many users, the pool is massive. Of course, it’s also a sort of a “little fish in a giant pond” situation. You’re competing against huge numbers of other vendors, and Facebook users only have so much space in their feeds. Instagram ads, on the other hand, is great for discovery and engagement. Companies that already have dynamic, powerful images should feel right at home on Instagram, where there are users just waiting to “heart” everything that is connected to what they love. Instagram is also ideal for targeting younger customers, since the membership is markedly more youthful than Facebook. What’s Better? Facebook or Instagram? So, which one is it? Which one should you use for you company’s advertising? Truthfully, there’s not really a “better” option in this scenario. It’s a matter of evaluating the tools provided by each site and matching them to your business. Spend time considering your demographic and target personas and ask yourself if you can find them on Facebook and Instagram--chances are, with the size of each site, they’re on there. It’s just a matter of how you reach them. Our recommendation is that you should run ads in both spaces, but targeting those ads to the strengths of each. Different content for different formats, using insightful strategies rather than a haphazard creation of ads. A good use of digital advertising on Facebook and Instagram can improve your visibility and increase your sales--you just have to know what you’re doing. Really you can't decide where to spend your time and resources if you don't know who you're trying to reach. Developing your target personas is a MUST for any business. If you haven't created your personas yet or need to refine them, we've developed a worksheet just for you! Download our FREE Buyer Persona Worksheet now!